The Marker dialog box enables you to change the previously-set or default parameters of a marker. Duration Express the duration of the marker in time code. The default value is 00:00:00.00. This parameter will not appear in the marker’s tooltip until the default value is changed. See Displaying Marker Tooltips. Colour Sets the colour of the marker. The default value is red. 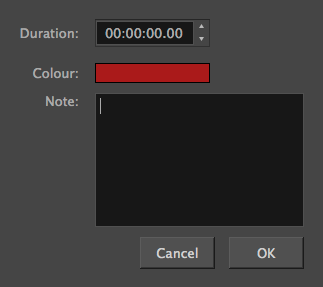 Once this parameter is changed, every marker added afterwards will have this colour until a new colour is set. Note Gives a name to the marker. The note can represent an action, noise, object and so on, that happens at the time marked by the marker. This parameter will not appear in the marker’s tooltip unless something is entered in the text field. See Displaying Marker Tooltips.